Again I am delighted to have been allowed to help out the Fence Collective with another poster design. This time it's for a Guy Fawkes shindig up at their Anstruther HQ. 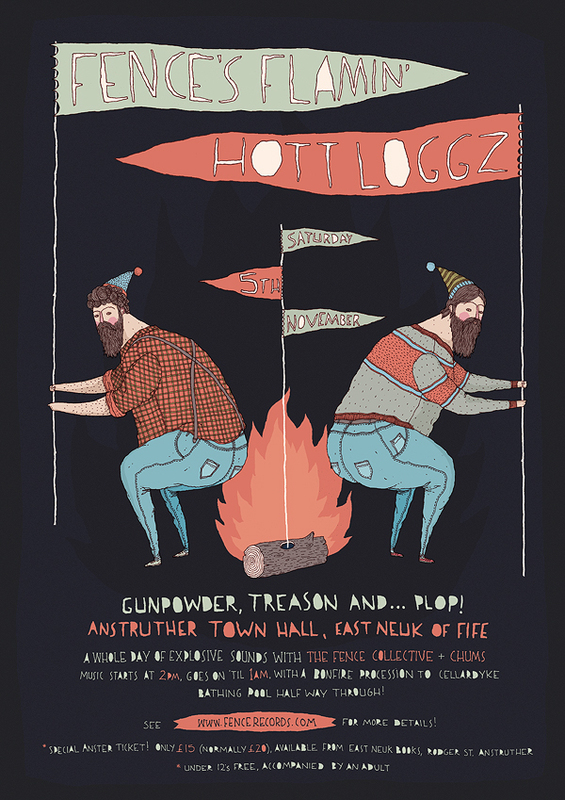 Johnny 'Pictish Trail' Lynch asked if I could come up with something suitably silly to illustrate his 'Gunpowder, Treason and… Plop' Bonfire Night theme. My time was quite tight but, thankfully, the brief kinda suited something being a little rough around the edges. Taking a cue from my What I Wore Today drawings, I cranked out this pair of beardy fellows and a titular hott-logg and things just came together. This is actually my first ever fully hand-drawn poster design, which took me a little by surprise. The colouring was added digitally but apart from that, it's all pens and paper. Getting text to sit well with my drawings is something I've always struggled with. Featuring a yet-to-be-announced line-up of Fence Collective members + friends. I'm gonna try my best to head up for the show. Despite the promise of a bonfire, a Scottish seaside in November will be damn cold, so wrap up warm.